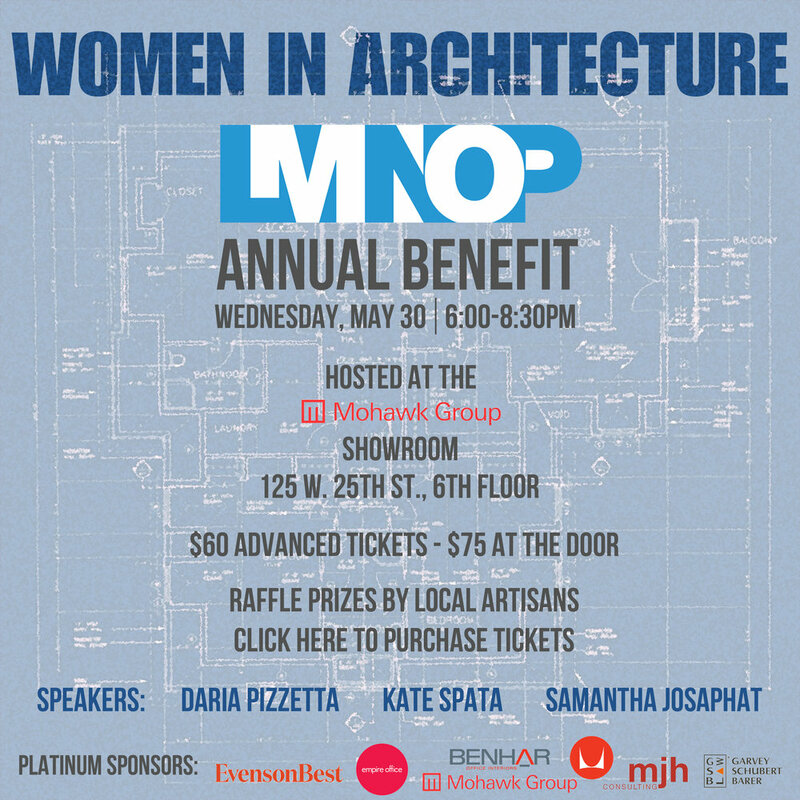 Join LMNOP on Wednesday, May 30th from 6:00 PM - 8:30 PM at the Mohawk Showroom for a celebratory night highlighting works and achievements of Women in Architecture. The event will include a dynamic discussion and Q&A by a diverse array of panelists including Daria Pizzetta, FAIA (Principal, H3 Hardy Collaboration Architecture); Kate Spata, AIA,(LEED Green Assoc., Dattner Architects), Samantha Josaphat, RA (Principal, Studio 397 Architecture PLLC) and will be led by moderator Yetta Banks (VP Design & Construction at Viacom Networks). You'll also have the opportunity to enter a raffle for a chance to win some great prizes! We thank you for your support and look forward to seeing you at our Women in Architecture event! LMNOP would like to invite our friends and colleagues to our 2018 Spring Mixer at Kimball Office. Our mixers are a chance to catch up on industry news, share stories with industry colleagues and reflect on what we have learned from the prior year. For our new friends this is a great opportunity to get to know LMNOP and what we are all about. Join us for drinks, refreshments, good company and conversation. Doors will open at 6pm. We look forward to your attendance! 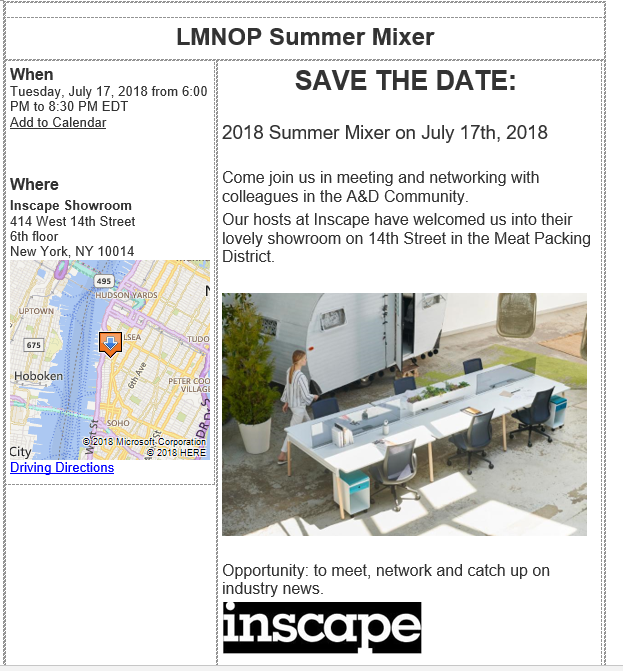 LMNOP is pleased to host our January networking event at the NY StoneSource Showroom. Join us to polish your networking skills, expand your professional network and stay engaged with your community! Holiday festivals are happening! It's the time of year when we like to invite our friends, old and new, to gather and enjoy an evening of holiday cheer and good company. This year, we will continue with the ABC Design Challenge! <= details in link! Prizes will be awarded and are sponsored by Knoll, Aerotek and SPK Lewis Construction. After the holiday mixer, all donated ornaments will be delivered with a holiday tree to "The Bridge," a supportive house for young men recovering from addiction. Shaw Contract will generously host the evening's festivities at their Union Square showroom, with co-hosts Architectural Flooring Resource and Skyline Design. Drinks and refreshments will be served.